The problem with modern BI and data science tools is they only report on one simple data set at a time. Harmonizing and reporting across multiple and complex data sets requires work outside the those tools. Analysts and IT teams must work through a continuous cycle of drawing data from multiple sources, making connections, performing transformations and cleaning the data for every new business question. With all of this time being spent on data prep, you may not be getting the best value from your BI and data science tools. With Anzo®, users can access multiple sources of complex data from any BI or data science tool. Using the semantic layer in Anzo, we rapidly combine all data into enterprise knowledge graphs backed by an easy to understand business model and make that data available on-demand via HTTP, OData, or SPARQL. 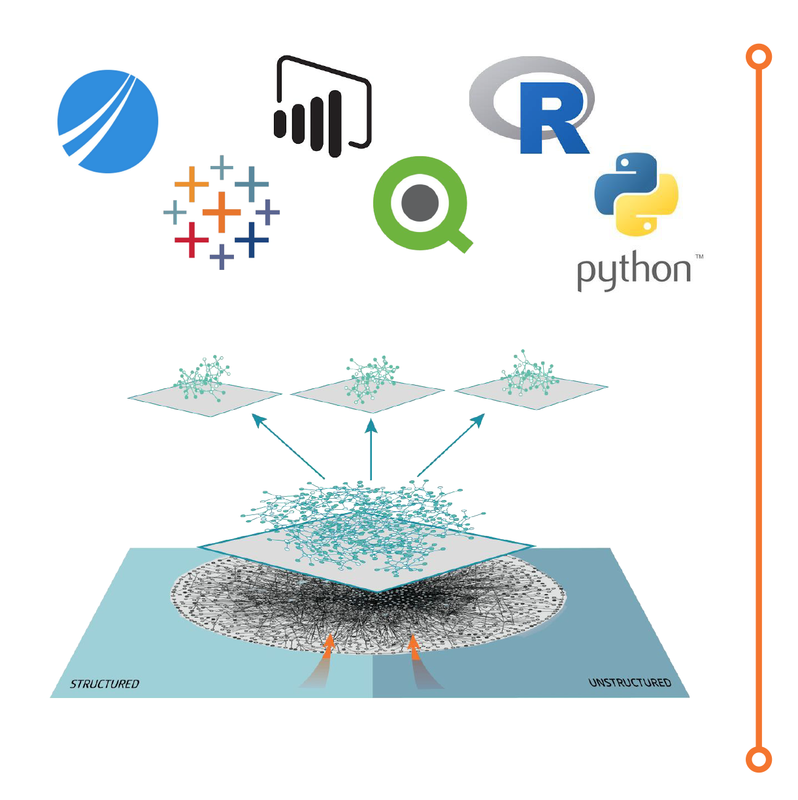 Our SPARQL Data Science Toolkit also allows existing algorithms to plug directly into the semantic layer. We install Anzo on your preferred cloud environment or on-premise infrastructure. We ingest, model, connect and transform your data to make it immediately available to the analytics tools of choice. Your analysts can explore data within Anzo before feeding it into analytics tools to identify and address any data issues before their analysis starts. In a matter of weeks, your analysts will be able to ask more questions than ever before against multiple sources of data. For a Pilot engagement, we help you choose 2-5 sources of structured and/or unstructured data to ask questions across. We use a semantic layer to connect the data sources based on their business meaning. Users browse a data catalog of their data. Users explore and prepare data to analyze without writing any queries. Data can be accessed from any modern BI or data science tool, downstream system or algorithm - no queries required. A clear understanding of the value of a Semantic Layer. A working Anzo instance in your environment. Access to harmonized data from multiple sources with any BI or data science tool. Project management, technical oversight, training and knowledge transfer for your technical teams and users. A forward-looking roadmap and engagement summary presentation outlining achievements. Click here to download this offer sheet as a PDF.